When I started this blog way back on 31 December 2013 I didn’t really know much about blogging. I didn’t even know how to load an image! I thought I’d probably be OK at the writing part – though writing a blog post would be much different to the sort of writing I normally do. This blog wasn’t going to be about complaints or campaigning. 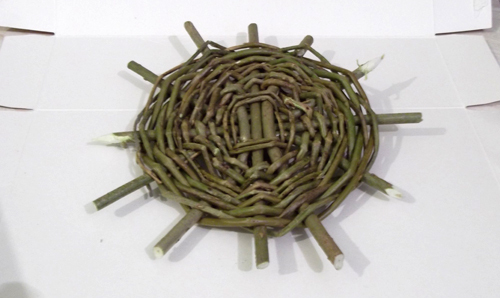 This was to be my creative outlet – accentuating the positive aspects of life, particularly around creative projects and sharing my love of our amazing natural world. Also, not being much of a dabbler in the demonstrative arts of the online social universe, I didn’t know what to do or what to expect from others. Should I leave a ‘like’ on a post? What about a comment? What should I say? “This blog is definitely a work in progress. I’m thinking that’s really the nature of all blogs. A blog starts like a tiny seed and as we nurture it, it grows. As it grows it develops all kinds of branching off-shoots, reflecting the blogger’s interests and inspirations. I think I was right with my “work in progress” notion of blogging. A blog is like an ongoing ‘live event’. We add further ‘acts’ to it on a regular basis. I think trying to keep in mind the question, “Why am I doing this blog?” has helped me put down the roots of my blog and helped me shape its own persona. Some things I have tried and then changed – different themes, different posting techniques. Other things I have adopted as more regular features of my blog: I aim to join in at least one photo challenge a week (Cee’s Fun Foto Challenge is my favourite 🙂 ); I aim to write at least one post a week on a current creative project – from crochet to gardening; nature’s art usually features strongly in my weekly offerings too. Through the Zero to Hero course I learned that as well as writing posts, there was another Very Important Element to blogging – other people! I have really enjoyed visiting your blogs, reading your posts and looking at your photographs. I have learned so many new things, seen some amazing nature close-up and ‘visited’ so many new places. It’s been fabulous! Suddenly, here I am, a year of blogging later. My 142 posts have collectively received over 6,000 views! “Thank you”, to all my regular visitors and, if you’ve maybe just dropped by to learn how to turn a shirt collar, “Thank you also – I hope you found what you needed”. (Did you know 4 people needed to know how to turn a shirt collar on Christmas Day! Wow! 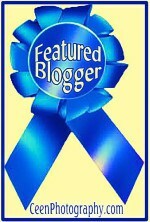 😀 ) I want to thank you all so much for joining me on my blogging journey. I truly appreciate your support. Here’s to another productive year of blogging in 2015! I have taken the theme of “nature” as the thread that binds this post together, but there are several strands. Today is Day 1 of the RSPB’s Big Garden Birdwatch weekend. I posted earlier in the week about this – and there’s still time for you to take part in the biggest wildlife survey in the world if you can find an hour to spare on Sunday. This morning we counted ‘our’ birds … 10 jackdaws. To us they really are ‘our birds’ as they were born and raised in the old chimneys of our house. It’s a pity ‘our’ starlings didn’t put in an appearance today, as seemingly unbelievably, starlings are becoming less common than you might think. Perhaps because it was not too cold, they were evidently visiting further flung pastures today. The starlings live in our flat-roof, above our youngest son’s bedroom. They nest there and hide out there too when it’s really cold. I did hear one of them talking on the chimney earlier in the week. As this afternoon turned wet and squally, it seemed a good time to browse other blogs to see how nature was faring elsewhere. As a self-confessed nature nut, I must say how heartened I was to see just how many other fellow bloggers care about our natural world. It was wonderful to see Suzy Blue’s flowering snowdrops on her Country Diary blog. Seeing snowdrops always makes me feel Spring is not too far around the corner. We have some snowdrops that grow right outside of our front door – but no sign of flowers for us just yet on our windswept northern hillside. We live surrounded by wonderful woods. I love trees – from tiny sprouting acorns to gnarled and ancient beauties. I was fascinated today when I learned about an amazing old Irish hedgerow in a post called “Bright Skies and Dark Hedges” on Littlest Allsorts. I am always intrigued by the ways we as humans have shaped our ‘natural’ landscapes. This avenue of veritable ‘old ladies’ can be seen along a roadside near Ballymoney, Co. Antrim. If you take a peek at it you will not be surprised to hear it is not unaccustomed to photographic attention having been chosen as a film location on several occasions, including for the popular ‘Game of Thrones’. To weave the final strand into this Nature Round-up, I want to share with you a poem I discovered today, “A Natural Curriculum” on the blog ‘wordsthatserve’. It describes to us an “alternative 3 ‘R’s”. I really liked this poem, especially as its first verse touched on one of my own ‘pet’ subjects, litter. For me those three concepts, Respect, Resilience and Reciprocity, as represented in this poem, should act as way-markers for human-kind as we negotiate our place on this planet. If you’re a UK-based nature watcher like me you’re probably also getting organised for the RSPB’s annual Big Garden Bird Watch this weekend, 25/26 January 2014. This is the world’s largest wildlife survey! We’ve taken part in this national annual spot check on the health (or otherwise) of our garden bird populations for a quite a few years now. 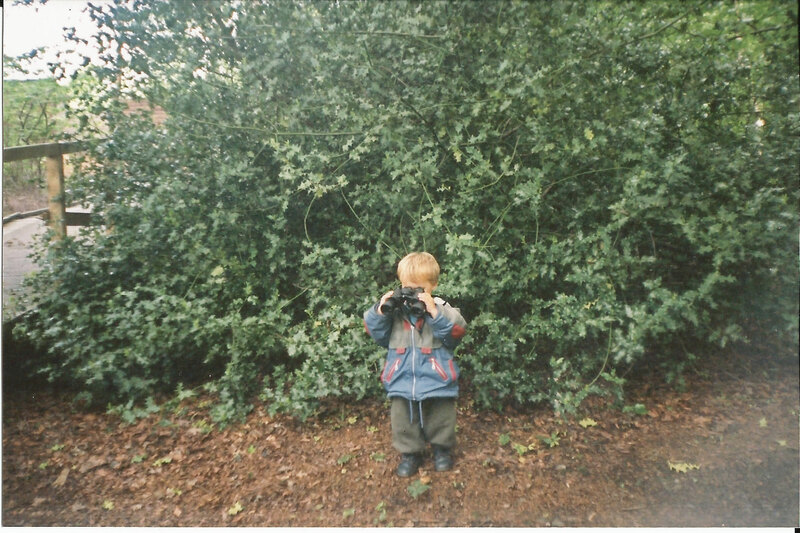 I found it was a great way to introduce our boys to birdwatching when they were still very young. In those days everything still came by post. So there would always be a build-up to this event when the Big Garden Bird Watch information arrived, which included a handy A4 bird ID poster. For years for our younger children we had an ‘original’ 2003 bird ID poster stuck at child height on the kitchen wall. … yes, if you don’t have a garden, you can do your bird watch in any nearby green space. This year you can even record your sightings on your laptop, tablet or smartphone using the new timer facility. We will probably stick with pencil and paper as usual and then submit our results online afterwards. The results need to be submitted by 16 February 2014. Because this survey is so big … an amazing 590,000 people took part and counted over 8 million birds last year … the data from it really is useful. Bird populations are a good indicator of wider wildlife health in our countryside. All the information about the Big Garden Birdwatch is on the RSPB website so if you’re in the UK why not try and spare an hour over this weekend to take part? Sometimes we start a creative project and then, due to hiccups and interruptions of one kind and another, it begins to feel as if the piece will never be finished. So when we do eventually manage to complete the job then success does seem all the sweeter. This week I saw a lovely hand-made patchwork quilt and learned that it had been one of those seemingly-never-going-to-be-finished pieces. The patchwork quilt has been created by Megan. Her quilt had been an ongoing project for more than seven years. I love the colours Megan has chosen for her quilt. There are shimmering blues, cerise and purples – perhaps reminiscent of the calming end to an ocean sunset. The colours speak “happy” and “peaceful” to me – which seems an ideal combination for a quilt. 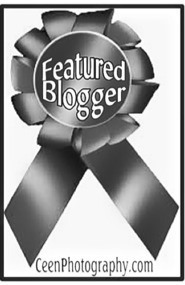 Megan is a fellow Zero To Hero blogger here on WordPress and I follow her blog “my chronic life journey”. Like others who suffer from a chronic illness, life for Megan sounds very much like a daily challenge. She says that finally completing the quilt was an “amazing achievement” and a really good feeling – that definitely sounds like a Purple Patch for Megan! I have been working on a rather long and drawn out purple project myself over the past few months. Finally, this week, I am pleased to say this project has become the next hat in my Oak Trees Studio Etsy shop. When I am designing I tend to choose colours that for me harmonise with the natural world. 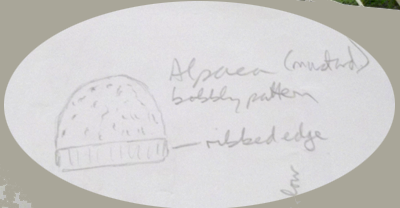 In this way, the damson alpaca yarn worked for me, although I have also seen the damson colour that I chose for this hat among the purple hues on the fashion cat-walks this winter. My own Purple Patch in relation to this hat came not so much in the actual crafting – though that part had been rather drawn-out for various reasons – but via my struggle to shoot some satisfactory product photographs of it for my Etsy shop. With volumes of advice and some technical assistance from two of my more photographically-capable sons, I was really pleased when I eventually achieved some shots I was reasonably happy with. Although I must add that I do take total responsibility for any defects in the photographs! While on the subject of Purple Patches and photography, I thought I’d share with you another purple ‘creative’ snapshot I grabbed this week. As I was choosing vegetables for a mid-week Winter Vegetable Casserole, I noticed these two red onions had randomly fallen into something resembling the yin and yang motif. Were they trying to tell me something about my work/life balance perhaps – my incessant multi-tasking? Or maybe they were congratulating me on completing that long-winded damson hat project … had I restored the yin-yang balance by finally finishing it? I really don’t know. I love the colour of red onions but I always think of them as more purple than red. What is a Purple Patch? There’s nothing quite like a woodland walk in winter. I love the woods at all times of year, but in winter I think woodland has its own special magic. There’s always plenty to watch out for as we wander along – and I do mean ‘wander’. Wandering allows plenty of time to absorb the atmosphere and enjoy the intricacies of the natural world. Leafless trees stand proud in their stark winter beauty. We notice the different colours of the twigs and branches – some purple, some orange, some green … and some are actually brown. The golden winter sun adds its own glow, and we see pink reflections on a group of white birch trunks cast from the red larch twigs 40 feet above us. We notice and name the numerous species of conifer trees as we pass along another path. I remind my son how to distinguish between Scots and Corsican Pine by counting the needles in each tuft. We see the recent winter rain has turned a normally-languid-stream into a torrent, gushing on its busy way through the culvert under the road. The next path we take is a real woodland path, carpeted with last year’s leaves and punctuated at frequent intervals by another winter woodland favourite of mine … mud! Mud, mud, glorious mud! We squelch through some patches but decide to edge around the larger swamps where the ooze looks to be of a more dubious depth. When we reach the pond, it looks oddly flat without its reeds, rushes and waterside flowers. We spot a few pond snails but most of the pond’s inhabitants will be resting safely in the silt at the bottom. We noticed a number of trees with broken limbs as we walked today. The weather has certainly reminded us of its power this winter – wind and water have both caused a fair amount of damage and misery here in the UK. We’ve been lucky and have got off fairly lightly up here in the hills. Our homeward wander takes us along one of our regular and well-known paths. We watch the squirrels chasing through the undergrowth before darting suddenly up another tree. 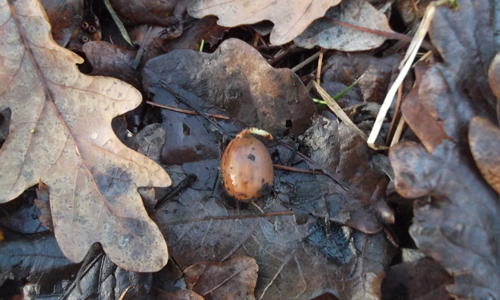 One sits motionless by an oak tree only a few metres away from us. We watch, the squirrel sits – we move on first. Again we enjoy the beautiful golden winter sunshine … and more mud! 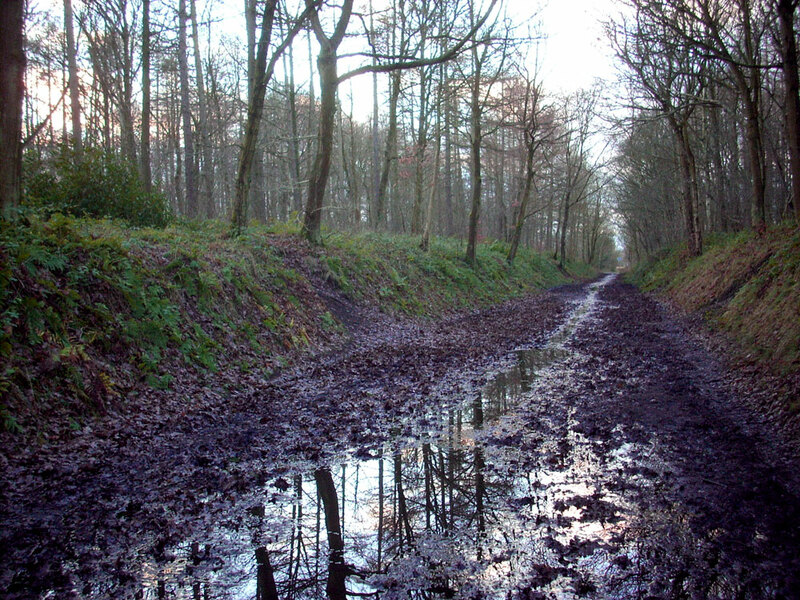 The puddles in the railway cutting are full of blue sky and pink clouds overlaid with dark reflections of the winter trees. Then, wending our way homeward, we spot a promise of Spring – flowering alder catkins. 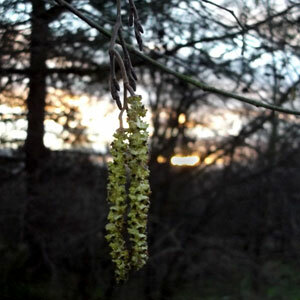 My son took this quick shot of the catkins against the setting sun – beautiful. As a yarn crafter myself I find I notice yarn crafting either in its regular forms or in more unusual guises when I am out and about. The recent festive period has brought me something of a flurry of yarn-craft-spotting opportunities. On a cold day in early December I found inspiration for a new hat design as I casually observed well-wrapped Christmas shoppers on a shopping centre escalator in Newcastle. A wool hat in a warming shade of mustard would be just the thing for a winter’s day. A hastily scribbled sketch was duly added to my shopping list. While hurrying our youngest son to his lunchtime optician’s appointment a week before Christmas, I spotted a young woman knitting as she sat alone in a crowded cafe. I couldn’t help wondering if she were frantically finishing a hand-crafted gift. Whatever her creation was, it was a beautiful shade of jade green. My third seasonal yarn craft observation was a curious one, in my local village supermarket. For a few days leading up to Christmas the staff swopped their normal uniform garb for some rather garish festive jumpers. I was served by a Christmas elf, Rudolph the Red Nosed Reindeer and a Christmas pudding! As Twelfth Night approached and the end of the festive season, like many other families we were taking down our Christmas decorations and tidying up. 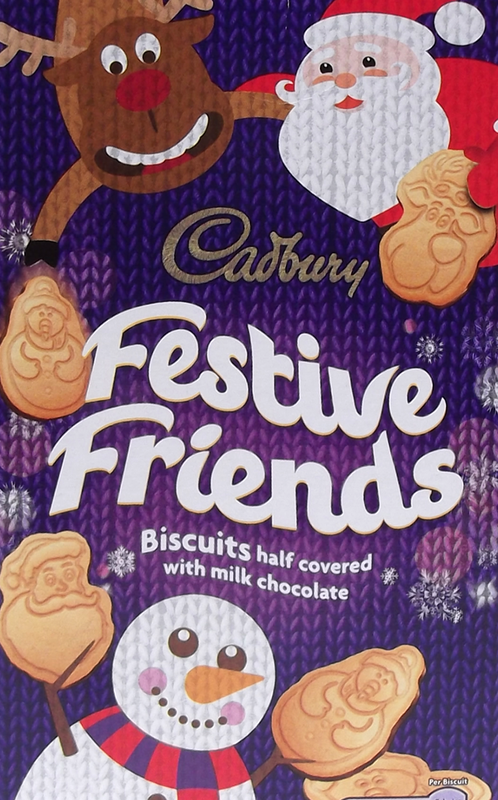 I was clearing out the clutter and I spotted another festive yarn – on this year’s Cadbury’s Festive Friends carton. These small chocolate biscuits are a firm family favourite in our house and this year the box had been designed as a knitted cover complete with snowman, Santa and reindeer. I found it quite interesting to see a yarn craft being chosen as a marketing tool by big business – an association of ideas with winter warmth and homeliness. 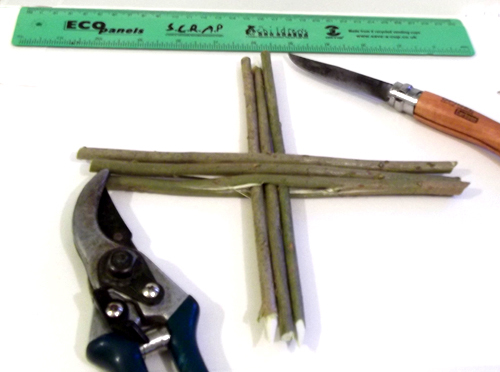 Hello and welcome to my new Oak Trees Studio blog! 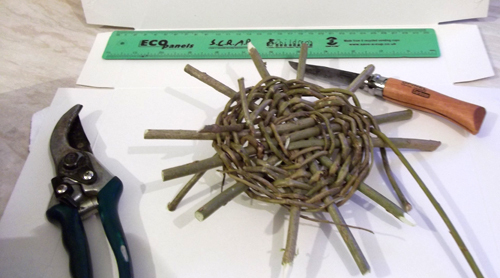 I am something of a nature nut and I love working with natural materials so it seemed a natural progression to develop this into a seedling of a business idea. My main aim through Oak Trees Studio is to share my love of natural materials – from wool to wood and from hemp* to hedgerow treasure … and hopefully start selling the hand-crafted items I produce. For my opening collection of hand-crafted items I have created some warm winter crochet beanie hats in real Yorkshire wool. 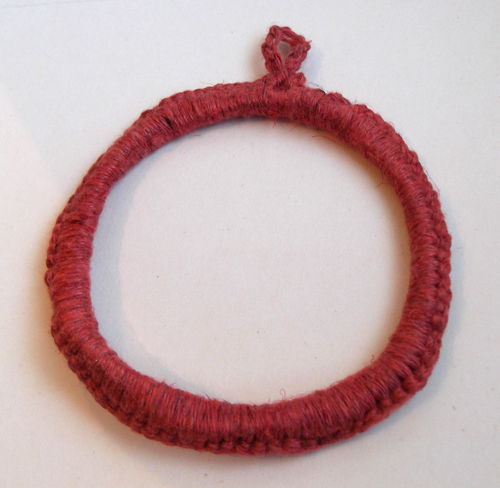 I absolutely love this natural un-dyed wool. The wools I choose are from small scale producers and the wool is all processed by hand and hand spun in North Yorkshire. I develop my own original hat patterns and then I crochet the hats. Crochet is my favourite yarn craft. I learned to crochet as a child – many, many years ago – and whenever I yearn to create in yarn, usually I turn to my crochet hooks. You may have noticed I added an asterisk * next to the word ‘hemp’ earlier. Agricultural hemp is an often-maligned member of the Cannabis sativa family. It is only a few years since it again became legal to grow agricultural hemp in the UK, though it has a long and illustrious history. This is a wonderful and very eco-friendly plant crop that I am sure to write more about in a future post. The hemp yarn I use is hand-dyed and comes in a myriad of beautiful colours. That’s a brief peek behind the origins of Oak Trees Studio. I hope you’ll drop by again to see what else we’re up to here on the blog and you’re very welcome at Oak Trees Studio on Etsy too. I want to sign off this post by sending my very best wishes to everyone who is taking part in the WordPress Zero to Hero in 30 days project. What a great WordPress idea for the New Year! Thank you Michelle too!